Rockin’ Robin – Tomato Town organically grows heirloom tomatoes in the greater Kansas City area as well as Johnson County, Leawood, Lenexa, Olathe, Shawnee, Merriam KS, Independence MO and Kansas City Missouri, KCMO. Varieties include: Cherokee Purple, Brandywine, Stupice, Carbon, Black Krim, Black Cherry, Yellow Pear, Absinthe and Aunt Ruby’s German Green. These sultry, summer temperatures have seduced us. We never plant tomatoes before the first full week of May, but the temptation to experiment proved too great. We planted twelve tomatoes in our back plot and are hoping for the best. 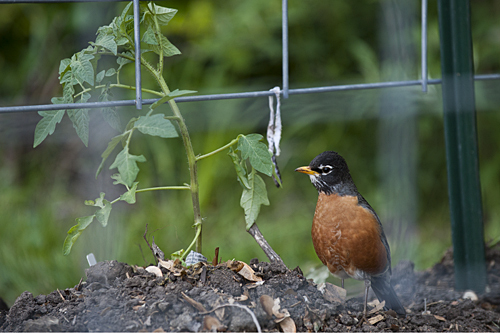 While we worked, our digging drew the attention of an American Robin who bravely darted between the plants hunting for insects and worms in the disturbed soil. Of course, we are picking up our usual order from local tomato guru James Worley this weekend, so look for our update sometime Sunday. This entry was posted on Friday, April 27th, 2012 at 7:55 am. It is filed under Planting, Spring Posts. You can follow any responses to this entry through the RSS 2.0 feed.